Ananka's Diary: Where Have All the Acorns Gone? Where I live there are hundreds of acorns. Yet oddly enough, no squirrels. The giant squirrels ate them...and soon, they'll eat US! We have tons of acorns here because we have these two huge trees downtown and they always dump thousands of acorns on the streets. Aw, poor hungry squirrels! I love squirrels, they're sooo cute! XD Strange about the acorns. There a ton of these weird nuts around my school, but the hobos always take them before anything else can. You know what, that's true! I totally didn't realize that there were no acorns until you pointed it out! That's crazy! I'll bet it's because of that Oak Disease my dad's always talking about... mabey some side effect no one knew about until now? If it can kill pretty much an entire species (or at least it killed almost an entire species up here in Northern CA) it may be out to get squirrels too! GASP! Are there ever any acorns around here? There are loads of acorns here in Missouri. It's about freezing though. I haven't seen many squirrels n a while. There's a black walnut tree in my back yard and I picked up one of the fruits, (this was 2 or 3 weeks ago) and it died my hands black and brown. They are STILL like that. The squirrels should eat more of those. Weird. Lots of acorns where I live. But I haven't seen a squirrel for a while. Oh, yeah, sorry about that, I'll give them back to the squirlleys. Aw poor squirrels! I've never seen one before. BUT I LOVE ANIMALS! I think that all of the missing acorns are in my front yard. As well as a whole country's worth of leaves. :( Plus... that is the fattest squirrel I've ever seen. That should be what is spooking people. In tucson, az there there are no acorns ( like there ever are) i'm sad to report. Yes it was weird, we have no acorns here! Weird! Though all the squirells are gone to!!!!!!! that is 1 fat squirrel! 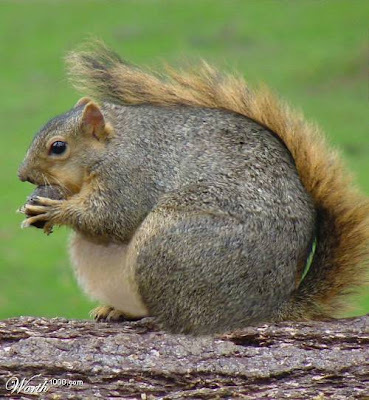 the squirrels around here aren't THAT fat!!!! !